Ah, yes: this year's Flying Monkey Marathon will be an epic showdown. The twist to this bet is that the winner of the bet is the person who finishes the race last. Ian is confident it will be him. I know it will be me. Even so I was eager to head out for a run with him and see exactly how fast he isn't. It was nice to play running tour guide. Even though I've lived in NYC for two years, I still feel like I don't really know this city. I hear it's somewhat of a shopping mecca; I wouldn't know since I do most of my shopping online. Theater? I hate it. Arts? I rarely have the time or the patience to take advantage of these things. * But running! That I can do. We only had about 9 miles before Ian had to return to his family. 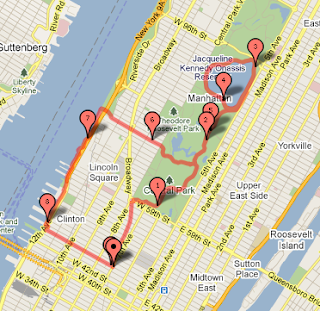 Starting from Times Square, we ran up Broadway to the southwest corner of Central Park, and then up through the park to the Reservoir. Ian barely resisted breaking out his best Dustin Hoffman impression (from Marathon Man - a reference that was sadly lost on me) before we headed back down through the park to the 72nd Street Transverse. Next, we dodged tourists to head across the park to the west side and over to the Hudson River to continue our run. That was a slight bit of bad planning on my part - I absolutely love running by the river. I love the serenity, I love the views (even if they are of New Jersey), and I find the other athletes out there to be less intense than in Central Park. But the strip of the river we ran, from 72nd to 45th, is immediately under the West Side Highway and kind of a no-man's land. Still, it was a gorgeous day and I had great company - what more can you ask for? And the verdict, should you wish to place your own wager on it? I will win this bet. I am now superduper confident that I will win this bet. It was almost a joke - I was huffing and puffing and panting and straining to keep up with him while he effortlessly strode through the streets of New York, trying to convince me that he really was as slow as he'd promised. Ian, you have made a sucker bet. I ran this post by Ian in advance, and his response was: "Oh yes - I'll be ahead... until the second half where you will reel me in, laughing as you pass my poor broken body, and then I will shuffle through the last few miles (as always). When that happens, please assure my wife and daughters that I am okay." We'll see, Ian, we'll see. Come 21 November, there will be only one bet winner/race loser. Apropos of nothing: a link to the NYTimes' latest running article. Evidently we distance runners are an insurance paradox: examples of healthy living, but hugely injury prone. Note the gratuitous "OMG Boston closed so fast!!" reference. *To be fair, I'm not completely uncultured. I do have a membership to both the Brooklyn and Metropolitan Museums, and I go to each of them any time they entice me with events serving free alcohol. Guy sounds like he is riddled with doubt and indecision. You can't help but beat him, therefore he will win. Nice try, Ian. We all have our moments of insecurity. Come race day, I fully expect to watch you pass me. Save some pie for me! Adios, New York! For now. BREAKING NEWS FROM THE WORLD OF RUNNING! A new alternative to the 9+1?